The inside of the tent at PowWow: A tester's paradise. Elevated Surfcraft photo. We just finished an event the snowboarding community in Jackson Hole looks forward to all winter long: The Jackson Hole PowWow. A week of shredding, events and testing every type of snowboard you can imagine spearheaded by professional rider and TGR veteran Rob Kingwell. This year we had a chance to sit down with a few up-and-coming independent snowboard brands you need to have on your radar. So give these guys a look, and remember: Support your local snowboard brand. Based out of Essex, Vermont, MTN Local founder Max Holzman presses one-of-a-kind snowboard shapes with custom composites, all of which are hand-built in his Vermont factory. After 9 years of heading up the warranty department for Burton Snowboards and seeing a variety of broken snowboards, Holzman began experimenting. Holzman takes handcrafting very seriously. MTN LOCAL photo. Fast forward and Holzman continues to refine the manufacturing process to produce some of the most unique, quiver killing boards out there. Each board is custom built by hand and tuned by Holtzman himself, with around 30 being sold over the course of the year. Constructed with a wood core that doesn’t have a need for topsheets or sidewalls, the shapes are shorter and wider than standard boards which give them more maneuverability and increased playfulness. 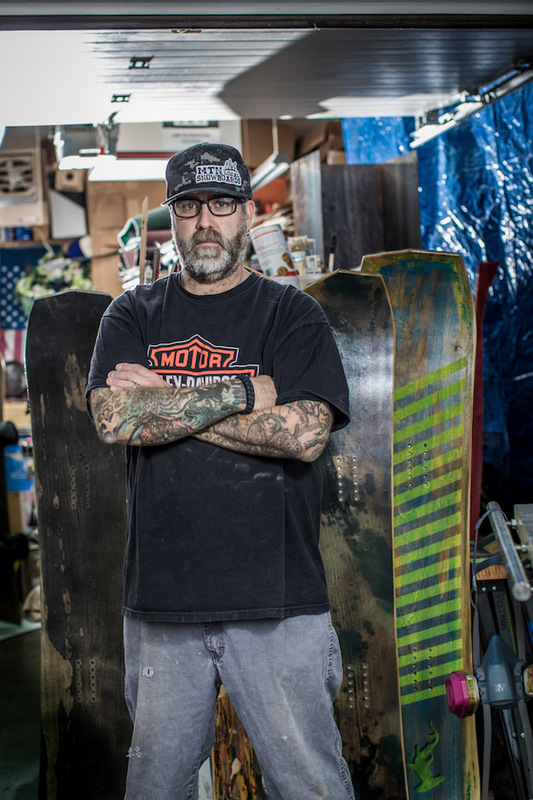 Why we love it: From the I-Beam press Holzman built himself to each board that he produces, everything is crafted with the personal touch of someone who lives for snowboarding. Plus the use of mostly renewable materials reveals the streamlined nature of the boards (they’re just good wood!) and reminds us why we started riding in the first place. Bottom line: If you’re looking for a small batch, custom-built board that will make you giggle, you found it in MTN Local. Elevated draws inspiration from the beaches of Malibu, so it was only right they showed up with some surfboards to PowWow. Elevated Surfcraft photo. Growing up on the beaches of Malibu, surfing was an ingrained part of Lebowitz’s life. After relocating to Montana where the water he was riding was the frozen type, he experimented on different boards searching for the perfect compliment to the movement of surfing snow. It wasn’t until visiting the Japan though, that Lebowitz discovered an even wider variety of board shapes that could be applied to the mountains. “It was just years and years of riding different types of boards, trying to find something that would match my movement on the mountain. I went through everything I could think of and it wasn’t until I went to Japan and saw the plethora of shape variability that could work in all sorts of different ways, did I really even start to think that there might be something different,” said Lebowitz. From there, the idea of creating shapes to harness the power of surfing in winter began to resonate. Connecting with a buddy who owned a press, Lebowitz began drawing out shapes which lead to the creation of his first board. Impressed with how it rode, he continued building and producing his own models centered around surfing. Four years later, Elevated Surfcraft produces three core shapes designed around the idea of creating high performance vessels for different types of movements on the mountain. 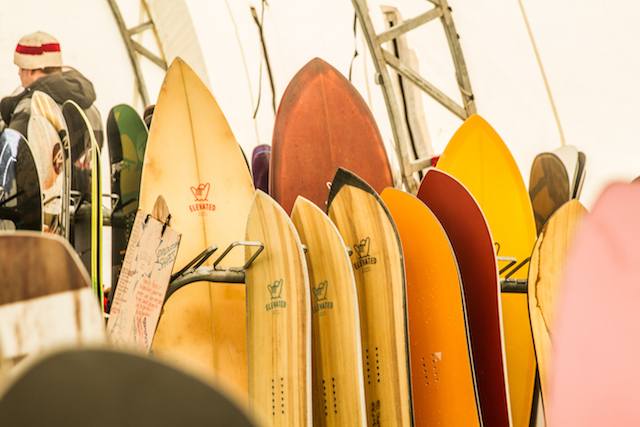 Elevated Surfcraft was born from PowWow, so its identity is born in the indy spirit of the event. Elevated Surfcraft photo. Why we love it: As Lebowitz has honed in on his craft, he’s started to play with the idea of designing different boards for riding specific mountains. For example, the Goldfish is best ridden on Lost Trail Powder Mountain in Montana, excelling in low angle terrain where it bobs and swims through the trees. Beyond that, each design is based off traditional surfboards templates that are translated to the perfect wave equivalent in the mountains. 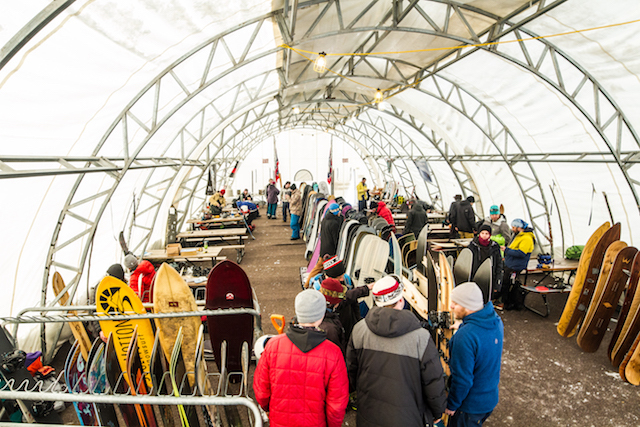 Bottom line: If you’re looking for a homegrown true surf experience in the snow, start with Elevated Surfcraft. 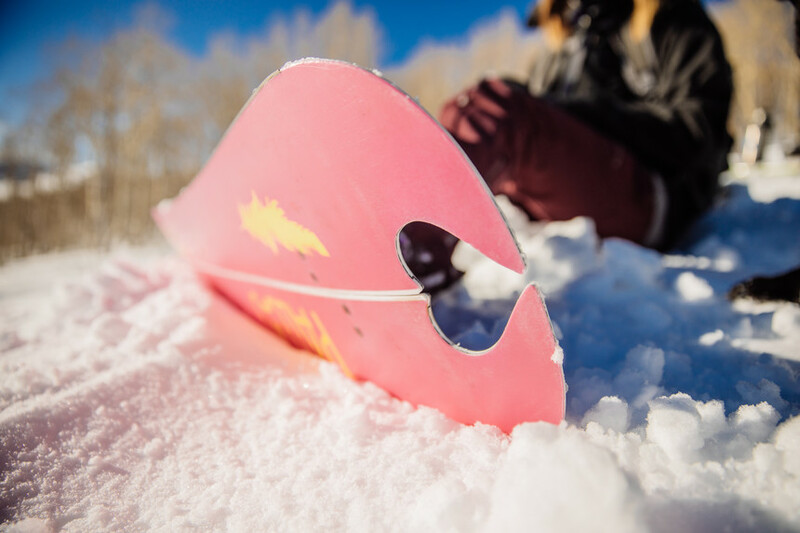 The manufacturing sister to Salt Lake City based Chimera Snowboards, Pallas Snowboards brings one of the first female-centered splitboard and snowboard lines to the table. In 2013, owner Steph Nitsch began prototyping with partner Alister Horn (Chimera Snowboards) with the goal of bringing more shapes, backcountry flavor and inspiration to women’s snowboards. Pallas Snowboards: Made with love. Kylie Fly photo. “The whole intention was to bring backcountry infused design and aesthetics to our splitboards and trickle that into our solid boards,” said Nitsch. Taking a different approach then most companies, Pallas started by working to hone in on backcountry splitboard shapes before using those models as a starting point for solid boards, creating a fleet of capable all-mountain boards in a range of shapes, sizes and styles that their female riders would enjoy. As one of the initial female-centered snowboard companies purveying the rise in attention on women in action sports over the past few years, Nitsch is invigorated at producing a female-specific product in the backcountry splitboard and snowboard space. They don't just look like artwork: They ride beautifully as well. Dirt Coast Photography photo. Why we love it: Pallas doesn’t just produce a diverse women's line of splitboards and snowboards, they also work to build the female backcountry community by offering grassroots backcountry splitboarding clinics across the west called the Backside Sessions. As a backcountry inspired brand, Pallas wants women to have the knowledge and education to be able to go into the backcountry confidently. Snowboards and splitboards are a tool, but you still need to understand how to use all your tools, and Pallas helps women who are interested in getting into or learning more about splitboarding and backcountry travel do so in a community space. Bottom line: If you’re a female rider interested in testing the waters of shapes and styles to expand your mark in the backcountry or on the mountain, go demo a Pallas.